Set this year for the weekend of May 31-June 2, the Orangeville Blues and Jazz Festival has, once again, been recognized as one of the Top 100 festivals in Ontario for 2019 by Festivals & Events Ontario. “That makes it eight years in a row. Must really mean one of the top 10,” Chuck Thibeault, Executive Director of Central Counties Tourism (CCT) suggested. Mr. Thibeault was attending the Orangeville Blues and Jazz Festival Launch, held at Mill Creek Pub, along with enthusiastic supporters, musicians, members of the media and business. He was there to confirm that CCT was proud to partner with the 2019 Festival. 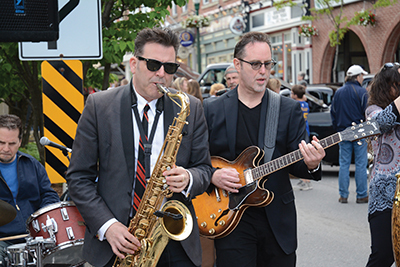 For the 17th year, the Blues and Jazz Festival will take over the centre of Orangeville to provide the busiest and one of the most exciting weekends of the year. Opening the launch event, President of the Festival Board, Josh Leitch, made a point of thanking the continued support of government and business supporters, particularly the Orangeville Business Improvement Association (OBIA), a major partner, and the Town of Orangeville. David Tilson, Dufferin-Caledon MP and a supporter of the Festival all these years, took the stand to comment on his appreciation for the value, musically, artistically and financially to the town and the region. He wanted to convey his decision to step down from politics, saying, “I’m out.” Meanwhile, he wished the best for the Festival in the coming years. Later, he told the Citizen that he would also not be going back to work as a lawyer, that while he has not decided what he will do, he intends to remain living in the area. One of the largest contributors over the last 11 years, the Downtown Orangeville’s businesses and merchants are well aware of how much the influx of the thousands of people who come to the festival, benefits the business community and the community of the town overall. Heritage Canada is providing financial support to help showcase “our outstanding local performers, which has become such an important part of the Festival’s programming,” Mr. Leitch told the attendees. He added, on behalf of the Festival, their appreciation for the continued support of the Ontario Trillium Foundation and the County of Dufferin. Orangeville Mayor Sandy Brown came with an official Proclamation declaring May 31-June 2 as the 17th Annual Orangeville Blues and Jazz Festival weekend. Then founder and artistic director Larry Kurtz took over to present the upcoming program for the 2019 Orangeville Blues and Jazz Festival. As he spoke, photographs of the coming stars of Blues and Jazz were shown on the screen beside him, faces that will gain some familiarity over the festival, as they fill the streets with music and a good time. He said Broadway will be closed for both Saturday and Sunday. New this year and quite wonderful is “a Festival Kid Zone” which will feature several family-friendly workshops, harmonica lessons, a photo booth, music art activities, drum circle and more. Always enthusiastic about promoting local talent, the TD Local Stars Tent will feature “plenty of great local talent” on Saturday and Sunday. The Orangeville Public Library is part of the action as well with special workshops. The Opera House takes its part on Saturday, opening its doors just before noon to feature “an extremely rare appearance by Halifax’s incredible Garrett Mason,” as well as others. On Sunday, Leisa Way and her Wayward Wind Band will raise the roof, as will musicians from Hungary and Cuba. On Sunday, from noon to 6:00 p.m., the Main Stage will welcome a fine list of solid award winners keeping us dancing in the park.